Things will go wrong — they say. That other day I had to deal with this complicated support ticket. I'd like to share the conversation and some thoughts on billing & accounting for startups here with you. Filed under: daily operations, book-keeping, best practices in worst scenarios, privacy over convenience, disaster communication, company culture, late paying customer, drama … Disclaimer: Mails slightly edited. I have just paid. Now it would be really nice if you could restore my App. sorry, no good news for you: I finally could get hold of a technician. I got confirmed that it is not possible to recover deleted Apps. I can totally understand your frustration at this point. You have just paid all open invoices in good hope to get your data back — and now we don't help you out here. As much as I would like to help you here, I can't. Deleting data is required as we don't want to store any more informations from our clients than we have to (we already need to store billing informations for 10 years!). When a client decides to leave or delete something, it should be really gone and not just don't shown up any more. So this is actually a good thing in terms of privacy. Deleting an App is final. It's also not our intention to hostage your data in such a way: "Pay us to get your data back". We have friendly practices regarding bounced payments. Other providers will immediately kick you out when a payment has bounced and you have not reacted within a very short time frame. We wait for at least two invoices were bounced permanently. We'll immediately send a warning mail when a payment does not succeed. We also retry periodically charging the card again. There is also a big yellow warning about open invoices, whenever you log in to the Dashboard. You can initiate a payment any time yourself and you can change the type of payment as well. In your case, already 4 invoices were bounced, I think. During the first weeks of the month we manually check for clients with multiple outstanding invoices and kill associated Apps to avoid further costs on both sides. The client didn't went berserk after all this. My highest respect for this! Getting paid is difficult, as well as not getting paid. 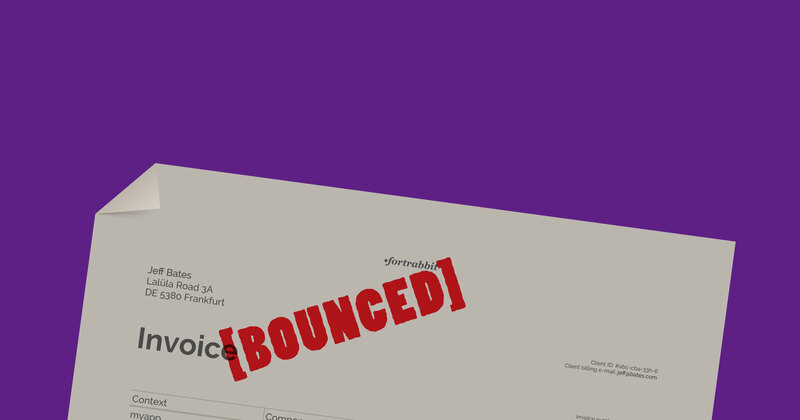 Dealing with bounced payments costs us time and money. We have to pay for each failed credit card transaction — in some cases more than the sum of the actual invoice. We are allowed to pass those costs to the client, but we don't do so (yet). By now, in the third year of our business we have collected quite a sum of open invoices. We could commission a debt collection agency or a law firm to represent and ensure our interests, but that's really not our style. I guess that's just the way this all works and there is no easy way around it. Let's keep calm and code on. PHP hosting for busy people. Git push your idea into the wild now.